BANGI, 30 Nov. 2010 – The Asia Pacific Region ever since the Second World War had faced numerous conflicts ranging from territorial and sovereignty to tensions over resources, influences, religions, ethnicity and values which the International systems had failed to address. This had brought about problems affecting human dignity in the region despite it being seen as the emerging economic power, said Universiti Kebangsaan Malaysia’s (UKM) Vice Chancellor, Prof Tan Sri Dato’ Dr sharifah Hapsah Syed Hasan Shahabudin when opening a Unesco-UKM conference on “The Asia Pacific Century: Challenges to Human Dignity” here yesterday. Her speech read by the Dean of the Faculty of Social Sciences and Humanities (FSSK), Prof. Dr. Sharifah Mastura Syed Abdullah. 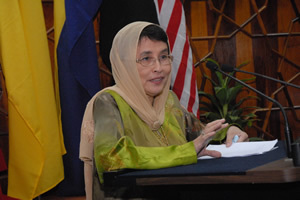 Prof Sharifah Hapsah said that matters have in fact been made worse and despite modernity, the quality of human life seemed to be on the decline while failure of the international systems to arrest the problems have resulted in atrocities and abuse of human lives and mass displacement of people. 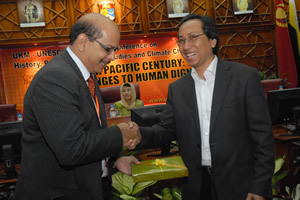 The two-day conference on the theme “The Asia Pacific Century: The Challenges to Human Dignity” seeks to define “Human Dignity” in the eastern context to promote regional stability and peace. Over 45 papers will be presented by speakers from 16 countries in the region. Prof Sharifah Hapsah said there was a need to re evaluate what constitute human dignity. What the west deemed as human dignity my not fit into the Asia Pacific melting pot of cultural and ideological differences which are quite distinct. Over 100 scholars, academics, stake holders and post graduate students from 16 countries are attending Conference on History, Politics, Strategic studies and Climate change. 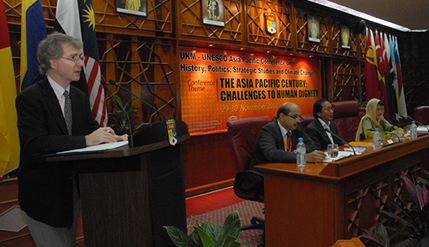 The conference also seeks to define “Human dignity” in the eastern context. It will cover a spectrum of issues under a myriad of topics such as, Human Dignity: Conflict & Society, Security: Foreign Policy & International Relations, Ethics, Climate Change and Resource, Regionalism & Interdependencies, Gender & Development and Democracies, Civil Societies and Nationalism. Another aspect that will be discussed is what constitute security. Insecurity which had always been blamed on Islamic extremists who wear turbans and keep beards have now been challenged by a more insidious threat: climate change. 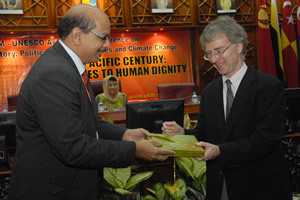 Dr Darryl Macer the Regional Advisor for Social and Human Sciences in Asia Pacific UNESCO said: “Our concept of human security, have been challenged through the dramatic changes in climate that are occurring and the political difficulties in reaching international consensus on practical measures to deal with the necessary adaptation and mitigation efforts required in each community,” he said. There are already in place various declarations made at the International level like the Universal Declaration of Human Rights, which aim to protect human rights. Universal principles, he said, is based on the Monotheistic Abrahamic ideologies subscribed by Muslims, Christian and Jews. “Among some Eastern tradition there is a resistance to the ideas of divinely revealed universal truths and Universal principles based on human reasons. There is a need for the reflection for biocentric and ecocentric viewpoints and on wider cultural and political perspective,” he said. The Conference is chaired by Dr Ravichandran Moorthy, a senior lecturer at the School of History, Politics and Strategy in FSSK. 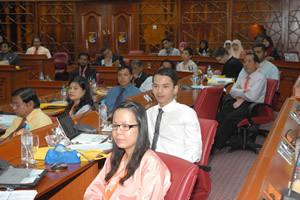 Chairman of the School, Prof Dr. Nordin Bin Husin is also attending.